Dietician Adrian Penzhorn explains why women might need to alter their diet according to their individual training programmes. August is National Womens Month in South Africa so we are taking a lady-like look at health, performance and nutrition. While the lack of a Y chromosome does not mean a female’s, dietary needs are vastly different to that of a male there are a few key points to remember that might help keep you healthier, fitter and faster. These include eating enough to fuel your exercise, developing a healthy relationship with food and a healthy body image and being aware of certain nutritional risks that impact menstrual and bone health. One’s requirements for how much food one needs to eat is not based on gender but rather body size, levels of activity and individual goals. The fact that females need less is usually due to a smaller body size and needing less fuel for this engine. Requirements for major food and nutrient groups are not significantly different between males and females either; once again body size, training load and personal or health goals will dictate deviations here. Exactly how much to eat might need some planning and assessing but keeping an eye on the scale and symptoms such as hunger, daily energy levels, quality of recovery, energy on the bike and menstrual function might provide some insight. The desire to change body composition is a common driver of nutrition adjustments and an overly restrictive diet that provides too little energy or too little of certain nutrients can predispose one to a spectrum of issues. For weight loss, the most food one can eat and still lose weight is the best method for health and sustainability. Dietary restrictions, eating habits or food choices often mean female athletes of various levels are at risk of consuming insufficient protein, fat, iron, calcium and vitamin D. These issues can lead to some chronic health issues as well as hormonal imbalances, muscle and bone injury and poor performance. Include a protein rich food with every meal – this could include lean meat, poultry or seafood, dairy, eggs, legumes, pulses, nuts or meat alternatives like soya, tofu or tempeh. Add some healthy fat to your meals – choose olive, avocado, nut or seed products or increase your dairy fat intake from low fat or full cream dairy products. Sufficient protein in a diet should ensure iron needs are met and consuming these with vitamin C rich foods can improve absorption. Iron rich foods include meat, legumes and pulses and leafy greens. The addition of citrus, kiwi, broccoli or berries to your meals will also provide some vitamin C. Supplementation may be required in certain instances if an iron deficiency is diagnosed but don’t supplement unless you know, it could be harmful too. Dairy is an ideal source of calcium to support health bone and muscle function. If you are not consuming any dairy by choice, evaluate this decision for your health and consider a supplement if necessary. Vitamin D, our sunshine vitamin, acts more like a hormone in the body and is responsible for numerous functions. Safe sun exposure of 10-15 minutes daily should suffice in summer but through winter extra oily fish, eggs or fortified products will help get a little more from your food. A low dose supplement (500 IU per day) may be required over winter but with the high prevalence of vitamin D deficiency a blood test is worth a check. If you have concerns about your nutritional health contact a dietician for support. Any signs of unexplained fatigue, bone injury, menstrual irregularities or regular bouts of colds and flus should be followed up with a sports physician and dietician. Fill a deep-frying pan with water and bring to the boil. Place your peas in a separate pot and cover with stock, bring to the boil and cook for three minutes. Add the ricotta and chili. Once peas are cooked remove from the heat, add the cooked cauliflower and blitz using a stick blender. Return to the heat, season with salt, pepper and lemon juice. While this reheats add one teaspoon of vinegar to your boiling water and carefully crack an egg into the water to poach. 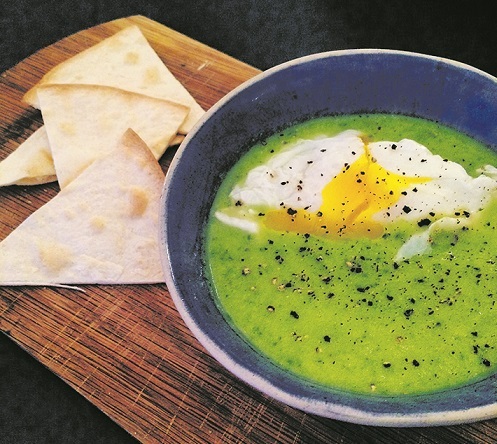 Cook for two to four minutes (depending on how soft you like your egg) and serve atop your pea soup.